The site offers a huge selection of sports, allowing punters to place an assortment of bets on more than 30 events, There’s also an in-play betting platform and a raft of promotions and bonuses. You can bet on the outcome of matches before they happen as a Fansbet member, although live betting also appears to be a strong speciality of the site. Indeed, there's a complete section dedicated to the current in-play betting opportunities across such sports as football, tennis, golf, baseball and futsal. All of the below sports are represented on the site, and many more besides. The odds can be considered to be average. When looking for value on the site, it may be best to look at popular televised football matches, as this is when they are likely to offer competitive odds. Horse racing betting is available on both UK and Irish and selected International race meetings. The races scheduled for Today and Tomorrow are listed and there is also a tab for Ante Post races, which includes big future races like the Cheltenham Festival. Cash out is available on all markets. This means that you will be able to take an offered amount of money before the event you have bet on ends. This could be to take your winnings early if the selection is in a winning position, or to cut your losses if it is in a losing position. With Live Betting section clicking on Inplay at the top of the Sportsbook Homepage, will take you straight to all the action going on around the world at any given moment. When accessing the website on a mobile device, it is instantly clear that each page is fully optimised for mobile use. It will automatically know which device you are using and will adjust the screen size accordingly. Furthermore, FansBet has recently launched its mobile app. The app is available to download on both Android and iOS and is essentially a mini version of the website. It is one of the most responsive and well laid out apps we’ve used which is perfect for betting on the go. Payment Methods are Visa, Visa Debit, Visa Electron, Mastercard, Maestro, Skrill (Moneybookers), Bank Transfer, paysafecard, UPayCard, Neteller. 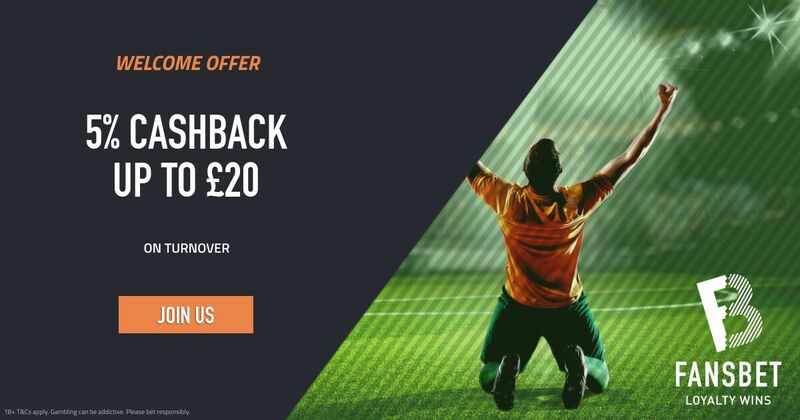 Make a 1st deposit of £20 or more and get 5% cashback on sportsbook turnover. You simply type in your club when registering then choose your local fan partner/club/organisation to receive funds on a quarterly basis - they track your bets and do all the hard work. The FansBet Premier League Fantasy game is similar to the other football fantasy brands in terms of rules, but the big difference is that the FansBet version gives you the chance to win a share of a huge prize money. There's a £100,000 guaranteed prize pool, and with the buy-in being just £22. Wanna know more details about Fansbet? Read here how does FansBet work! Fansbet casino is powered by leadind platforms, between them: Play'n Go. The online casino is home to a wide selection of video slots. Among the most popular ones are Guns N Roses slot, Book of Dead slot, Golden Ticket slot, Immortal Romance slot, and many more. The site features a solid collection of roulette, blackjack and baccarat. More precisely, the selection includes 21 Burn Blackjack, American Roulette and Gold Baccarat. In addition, the casino offers a wide collection of video pokers, such as All American Poker and Aces and Faces. If you sign up with FansBet Casino today, you'll get an amazing Welcome Bonus: 100% bonus up to £200 and spin the reels on the most popular slot machines! FansBet is perfectly positioned to take the sports betting world by storm. It is an uniquely-rewarding betting site, the only one where you and fellow supporters of the team you love can always benefit, even if you don't back a winner every time! FansBet has an interesting offering, and does everything right in terms of the basics of online bookmaking. Their new customer welcome offer is not over-complicated and there are some interesting promotions too such as free entry into the Jackpots. Open a new Fansbet account for free! Click here! "FansBet Review - Ratings, Bonuses, Games, Payments and Support"